AHOY! Ya scurvy seadogs, it be your ole pal Captain Jack Valkor of the S.S. TOV here ta tell ya about a new game. 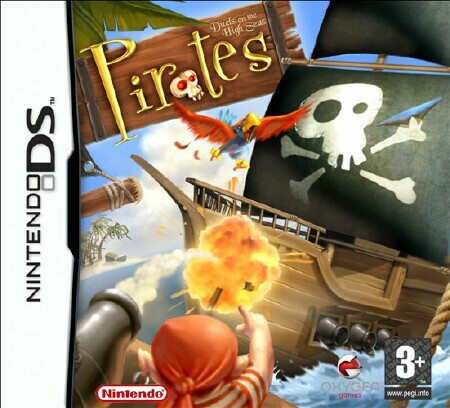 It be from the folks at Oxygen Games and it be called “Pirates Duels on the High Seas” for the Nintendo DS. So prepare ta set sail maties we be off to discover!! Alright enough of that schtuff let’s talk about the game. 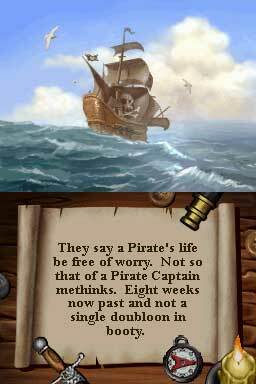 Pirates puts you in the role of a captain who looks to discover 7 golden keys. These keys will open up a world of treasures, but in order to find these keys the captain and his crew will traverse the 7 seas. Along the way they will battle naval ships, steer through deadly icebergs and face off against vile monsters. Oh and before I forget, after you find the first key, you’ll be cursed and you have to find all seven keys in seven days before the curse takes full effect. Wow that’s a lot of sevens. So let’s not leave out that it’ll take about 7 hours just to play this game. First thing you do when you switch on the game is choose whether to “Set Sail” or Multiplayer. Multiplayer is obvious (player vs. player). 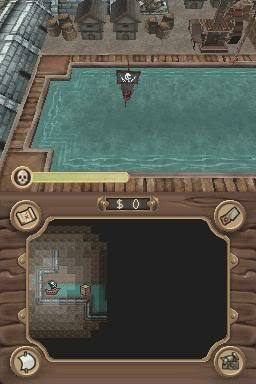 “Set Sail” puts you into the main game. There you can choose a new game or “skirmish”. In skirmish mode you get to practice your sailing skills by first choosing your type of ship which comes in “Easy” (A large ship that can sustain a lot of damage), medium (a smaller ship that’s fast, but also more vulnerable to hits) and hard (an even smaller ship that can’t stay afloat if hit too much, but it’s seriously fast). Once you choose your ship, you choose where you want to battle of the seven seas. When that’s done you’re dropped into the arena, battling top down against other ships in the game. The upper screen is where you see all the action and the lower screen is your map. You have access to all the weapons, but you gotta pick them up to make use of em. Plus gold will be strewn about, which you’ll need or you’ll never make it through a skirmish. You use gold to pay off your crewmen (by touching the 4 icons on the lower screen) who will navigate your ship (sail icon), repair it (saw icon), increase the range of your cannon (cannon icon), or increase your map visibility (map icon). You’ll need all this practice for when you dive into the main game. 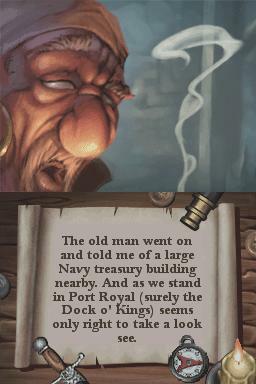 In story mode you will follow along with the captain as he tells his tale of the seven keys through his captain logs. His logs will also give you a hint of what you’ll face in the stages ahead and reveal more of the story behind the seven keys and how its curse is affecting others and his men. Speaking of which you’ll also pick up other characters infected by the curse of the keys such as King Midas (you know the guy that turned everything to gold the moment he touches it) and you’ll also pick up other crewmen from the ships you drop. These crewmen will increase one of your four skills so that you can shoot farther, sail faster and repair your ship faster too. Each stage is broken into four chapters, the last being the boss battle. So what do I ultimately think of the game? I like the story mode; it’s pretty funny stuff. Not funny ha, ha, just funny as in yea “that’s unusual”. Like when King Midas shows up. I would have never suspected until you start seeing gold objects like a gold tree or a gold ship. The controls are also pretty sweet too. The shoulders control forward and reverse, the D-pad covers direction, and the A/B buttons are your cannons and special weapons respectively. Pirates is very easy game to get into without ever reading the manual. Seriously you can figure everything out in seconds. The sound effects fit the game nicely, I love the sound of the waves and the seagulls; it really puts you in the game. Plus the canons when you fire em off are pretty sweet. The graphics are also pretty basic; then again this is a simple game; nothin fancy and nothing visually heavy. 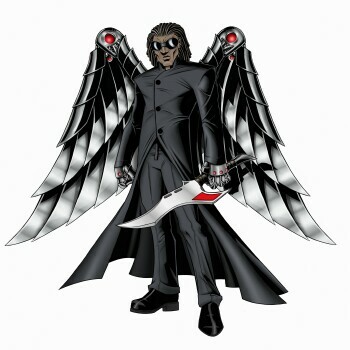 First the graphics; I know I said they were simple but hmmm maybe a little too simple. The top down view isn’t bad but I’m supposed to believe, based on this top down view, that I am floating the seven seas? Looks like I am sailing through the canals of Venice. Plus everything looks the same, though the Artic stage is a nice change up as you battle against ice ships, gun towers, dynamite boats, and deadly icebergs. Second is the music; or lack there of. You get “Blow the man down” in the beginning, a tune when you clear a level, and a tune when you battle the boss. 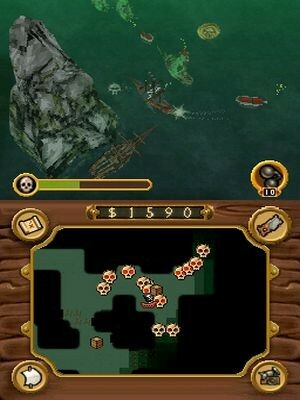 That very, very weak “argh!” you get when you start a new level. It’s very annoying. 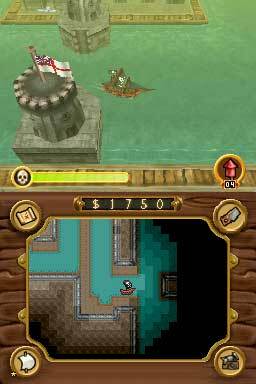 But overall “Pirates Duels on the High Seas” isn’t a bad game for the DS. It’s definitely a game you’ll wanna play when you’re not playin somethin serious like Chrono Trigger, or Final Fantasy 4, you know a game with some serious meat on it. Pirates is more like a tasty appetizer before the main course. It’s not addicting, but you won’t wanna put it down until you reach the end. So out of TOV 5 stars, I give Pirates Duels on the High Seas, 3 stars and it’s been Valkor tested (Argh!) and TOV approved, matey.